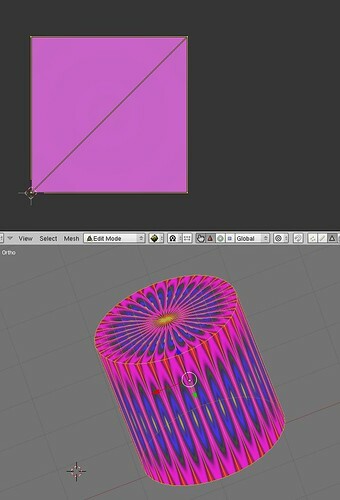 I decided to do some tutorials on UV unwrapping using Blender. This seems for many of us , one of the most difficult things to master. I will try to explain what i learned myself using the trial and error method. So this will be nor complete nor perfect, because i am still learning myself, and after 3 years using Blender i still learn every day some new things. So if you notice something that can be done better or easyer , please do not hesitate and correct it or explain your method. 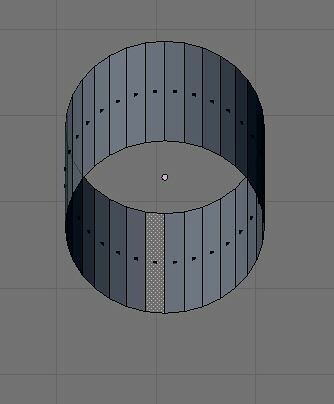 Today i will start with the first tutorial on how to unwrap a closed cylinder. There are several ways to do that, with different results. i can't say, its totally depending on the kind of texture you want to use. Therefore i quickly made two different kind of textures. One texture with regtangular patterns and one with a rounded pattern. The textures are not choosen for their beauty, but because you can easy see what happens when you apply these textures to different shapes. 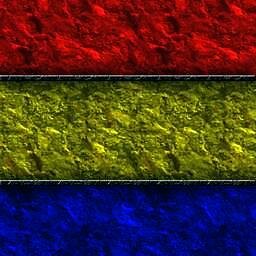 Here are the two textures we are are going to use. This first image shows it in object mode. Now we switch to the edit mode using the tab key. and we boxselect the upperside with the b key. Now switch to the top view and unwrap the select part using " project from view method. The result is in the next picture. Switch to face select mode and press H to hide the unwrapped faces. Repeat all we have done for the bottom part. we change to front view and select with the A key , the remaining faces. This time we will unwrap those faces by using cilinder from view! In the 3D window press ALT H to unhide all faces. select all faces with the A key. 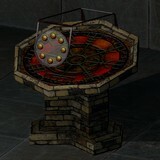 The next tutorial will be about texturing this object. After that we continue with the same cylinder but do it totally different. Let start the texturing part. 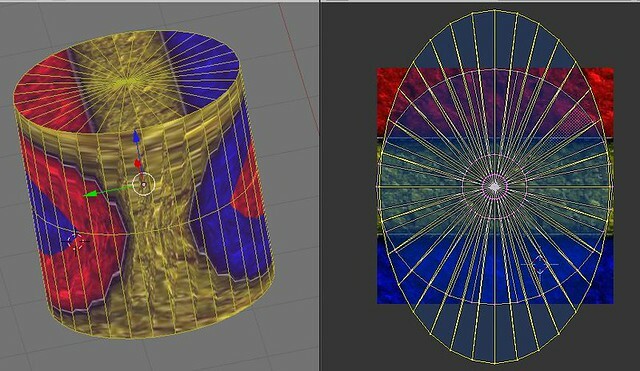 First we will make a copy of the existing unwrapped UVmap. We do that by pressing the new button besides it. I renamed it to Ao because we are going to use it for Ambient occlusion later. You see we still have selected the first layer. Now add a new material . 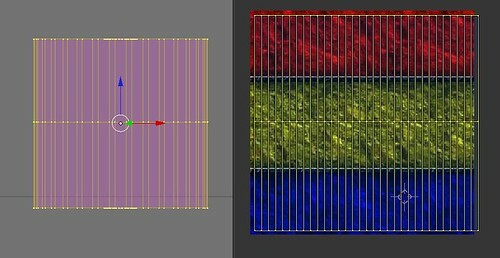 Set the material input from the default ORCO to UV because we want to use the uv layer. Also add the texture , the round one. don't forget to set it to "image", i won't get into detail how to do this, i suppose you already know. 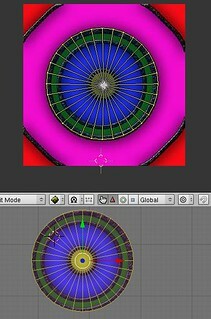 In the uv editor choose the same image from the pull down menu ,you can fix it there if you want. Now in 3d window go to texture mode. tab into edit mode and select all. if the screen in the 3 d window stays black, its because you have the emit value not set yet. 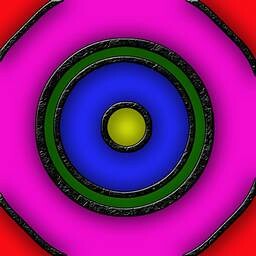 Now you can start texturing in the uv/image editor. 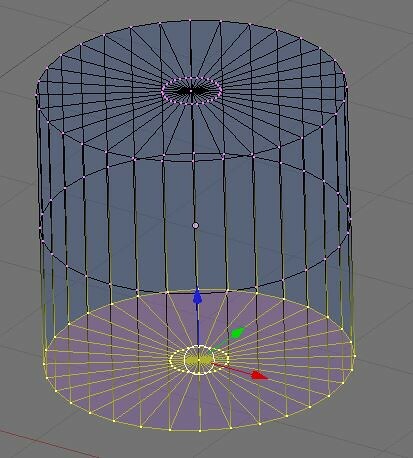 first deselect all vertices in there. 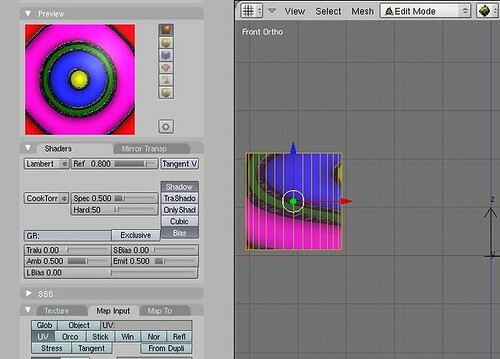 Now select one vertice of the one of the circles in the uv editor. 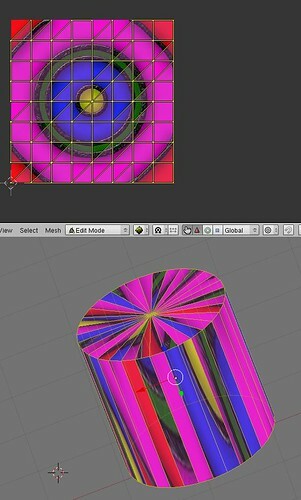 Press Ctrl L while in the UV editor and you have selected the top or the bottom of the cylinder. Drag it to the center and scale it up until it corresponds with your wishes . You can see the result immdiately in the 3D window. And finally for the square formed side of the cylinder. Scale that one up till it fits in y direction and scale twice as big in x direction. Now the texturing is done , the result is shown here. Hmm, i don't want those round texture on the side. 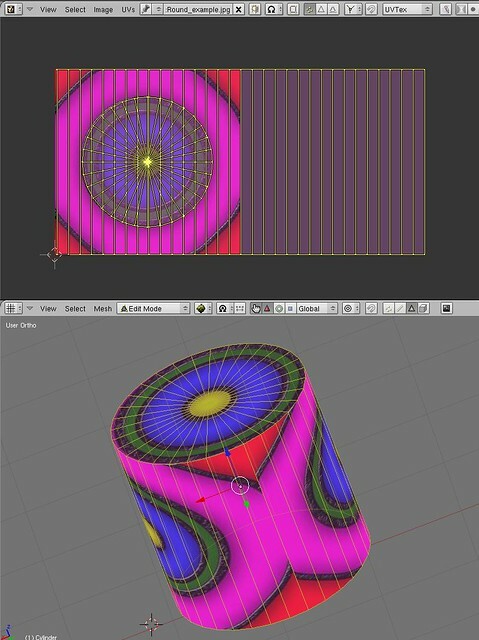 We will change that with another UV layout in the next tutorial. Before we are going to change the look of the same texture by unwraping the cylinder in a different way, its time for another thing you also have to know. The reset to ORCO . We can leave the setting as they are and directly go to the 3d view window. tab into edit mode if you are not still there. Press U and this time select " reset"
All the square faces now contain a copy of the whole texture! The top faces are triangles and contain only half of the texture. We now have an ORCO situation into the UVmap. This is nearly the same as what you get if we had choosen in the 3Dwindow for an unwrap using the " lightmap" command"
Next tut will be about the other UV layout. Any chance someone put a link to it in the Wiki ? People will be more likely to read it. 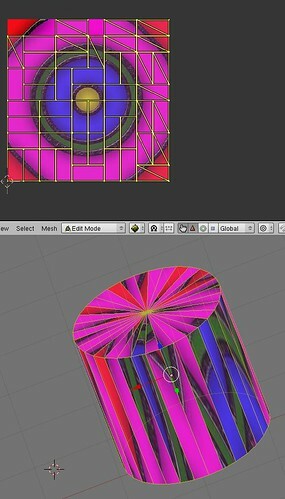 first we select all the bottom faces in the 3D window and press U . Choose the unwrap method : Project from View " Bounds"
This will invert your selection. all is selected except the bottom! Go to the top view and again unwrap the project from View" Bounds." Now select the ring with Alt pressed and a right mouseclick at the same time. You can clearly see that because you started this from top view the two vertex rings where exactly projected over each other. One was hiding the other. Now you can scale both rings undependent from each other and its easy to get our final result. You see that with the round texture we now have a result as if it was coming from a square texture! 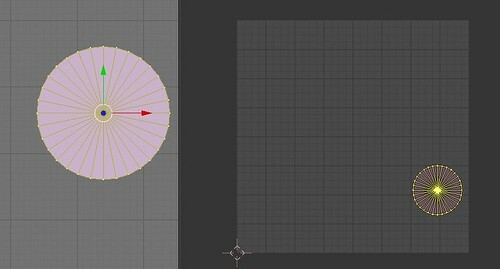 In the next chapter i will use the square texture to do the opposite and make it look rounded. First swap the texture to the square one. 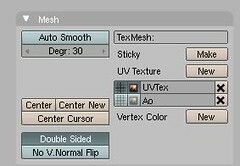 Then we continue with our last UVtex in the editor window. Choose inside the editor window the new texture. 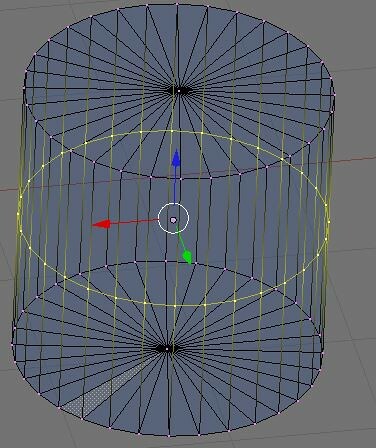 Scale the two rings of vertices a bit to the center and the other to outside the image. Normally i always choose the wrong ring but this time i had luck . But since we see the result immediately in the 3D window its corrected in a jiffy. You can already see the rounding is coming. Lets make this a bit better. Now we first unwrap the upper half from top view , using project from view bounds. Then when in face mode do a Ctrl i to select the other half. Unwrap it the same way but this time while in the bottom view window. Now select the linked rings as we have done before. 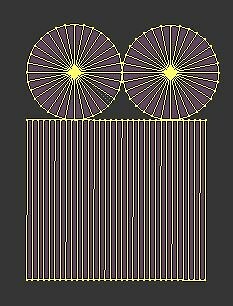 The next pattern is achieved by selecting top and bottom faces . unwrap them from top view to the bounds. Then Ctrl I to swap to the remaining faces in the 3D window. Unwrap them also from top view to the bounds and scale the rings. This time there are 3 rings on each others top so you have to scale them both separated. 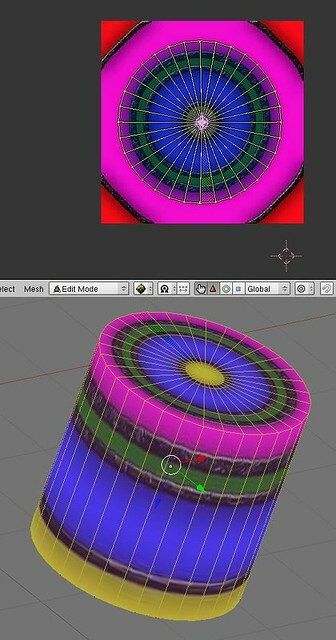 Here is the result, you see that the colors of both circular textures are inverted or mirrored. 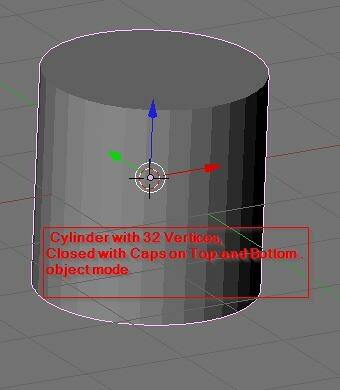 In the next tutorial will do the unwrapping again with the cylinder from view command. 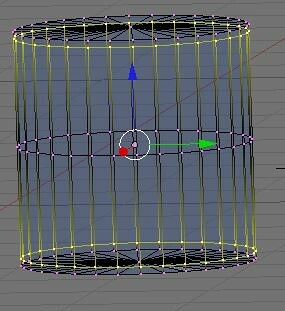 Now scale down the top and bottom ring of vertices and after that flatten top and bottom until you have this. 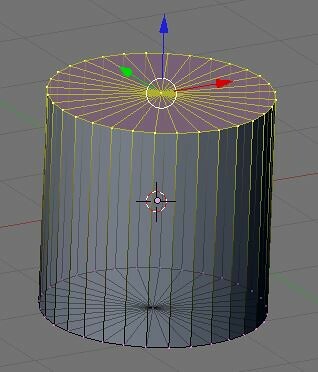 When you have done that select all vertices except the 2 tp and bottom centerpoints. Now go to front view and unwrap cylinder. As you can see the layout is not exactly square. Then while in front view press the the 6 on the numeric keybord. that will rotate the cylinder 15 degrees. You cannot see the difference but after unwrapping it looks like this. If that is not the case in your situation then rotate it 15 degrees more, and unwrap, there always is a position that it will be square! As we have learned in other tutorials . 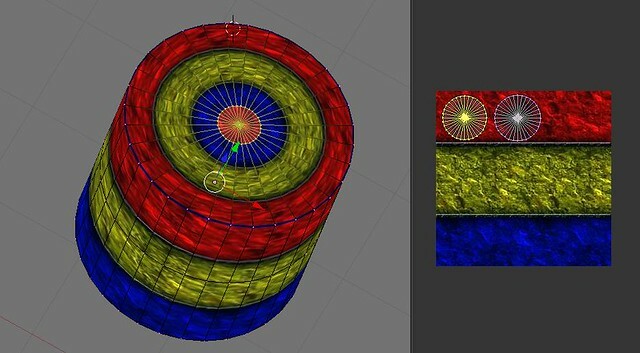 we know that behind the upper and lower vertice rings in the uV editor is a hidden ring of vertices. Select those and pull them up and down. 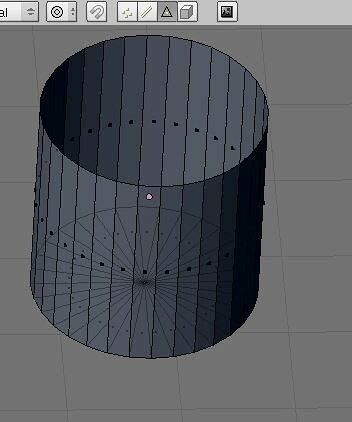 Now select the top ring of faces only, select in the editor the lower vertices and pull them completely down to the texture. There we see, that our square texture is round as intended. finally we can select the small innering of faces from top and bottom and give them an view from top and adjust the scaling. With adding a few rings in the last example i had a special reason. If you look carefully to the object then you can see that the difference between a cylinder and a UVsphere is not so big. Its only the radians of the rings and their position in the z dimension that differs. So why should the unwrapping be different? So first add a sphere. 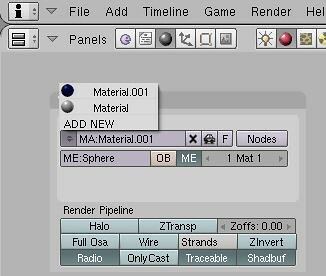 You can use the same material , so use the pull down menu in the material setting, then all the same parameters will be set automaticly. Now you have done that. select both, the top and the bottom vertice. Invert your selection with Ctri I.
Goto front view, turn view 15 degrees with numeric keypad. Unwrap your selection using cylinder from view! Now in the 3 dWindow change from vertice selection to faceselection. Press H to hide your selection. now select the upper faces go to top view and unwrap from view. Crtrl I to invert your selection. Ctrl 7 (numeric pad) to switch to bottom view.